Friends Of Bees - Bee Blog, Beekeeping Information, Hive Shares, Pure Raw Honey, Bee Information, your honeybee resource online! 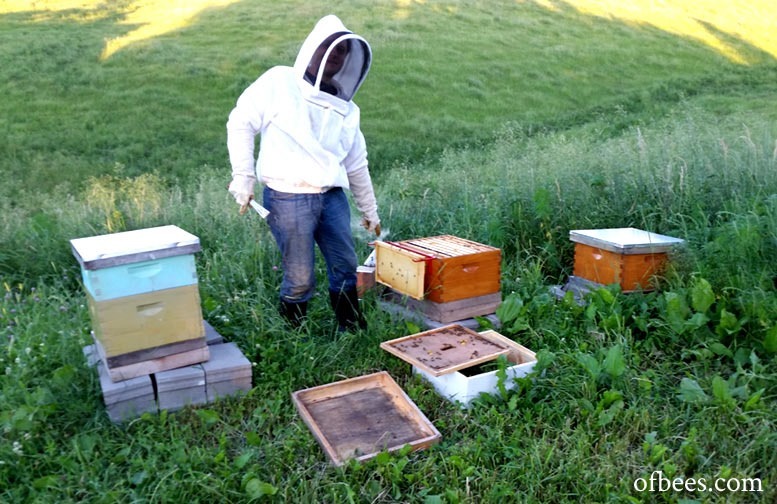 2014 was a productive year for us, with all seven colonies of bees flourishing and establishing well, building up and preparing well for our long Minnesota winter. 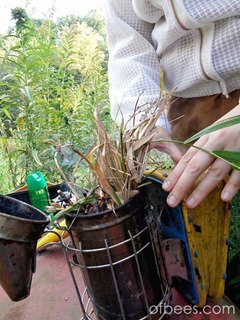 We also had our first chance to render extra beeswax (a byproduct of honey harvesting) and make some candles! Here is a photo of our smoker. We use grasses, twigs, and leaves from around the farm to produce the smoke which helps calm the bees as we work with them. 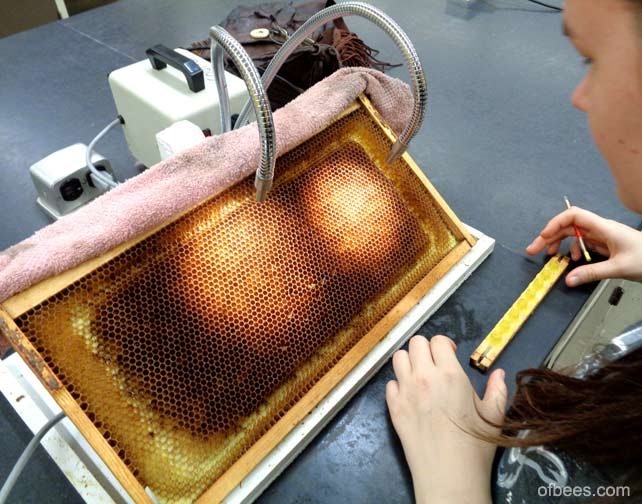 The smoke works because the bees act as if there is a wildfire – eating as much honey as they can (in preparation to leave the hive with resources if a fire is coming) instead of being defensive. Since it is just used in a small amount for a short time, it doesn’t hurt them, just distracts them so we can work. A huge thank you to all of our 2014 Hive Share sponsors, who were a major help in the expansion and running our our apiary this year! This particular hive was sponsored by Ursula Vernon. 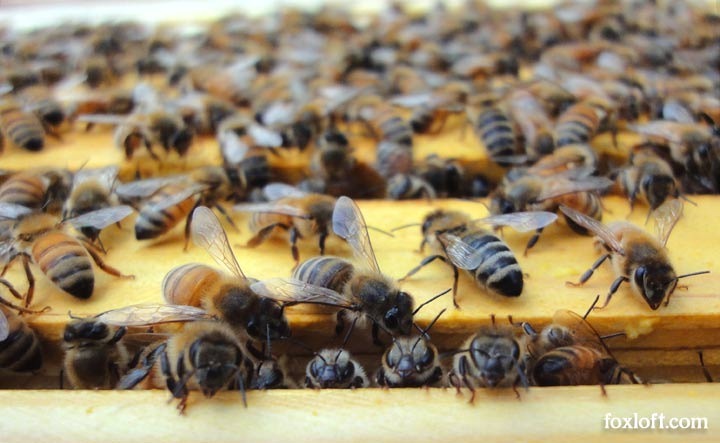 The queen was Carniolan and the bees built up slowly but caught up really well by the end of the season! 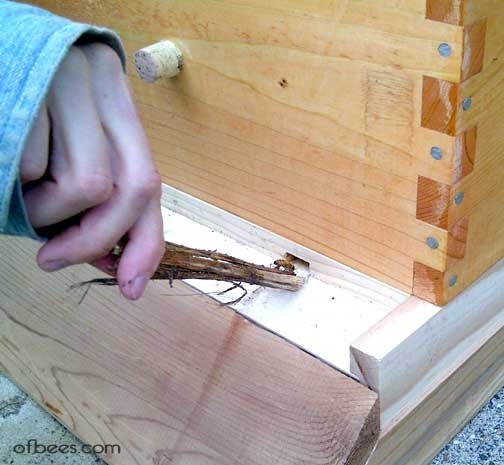 Foxfeather preparing to graft bee larvae – part of the process of raising queen bees. 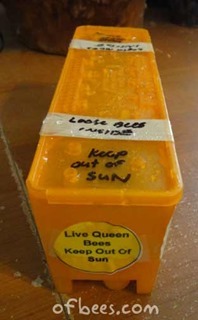 Having been pretty enraptured by the bees and really enjoying our apiary, the next logical step for us was to explore the idea of breeding our bees and raising our own queens. 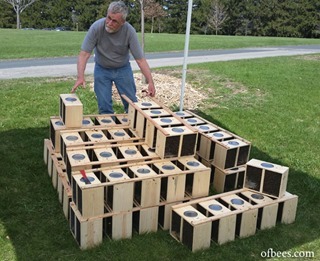 Right now we (and most folks in the Midwest) get bees from large commercial operations in California or Georgia, but it would be nice to work on developing local stock and being less dependent on bees shipped in from across the country. 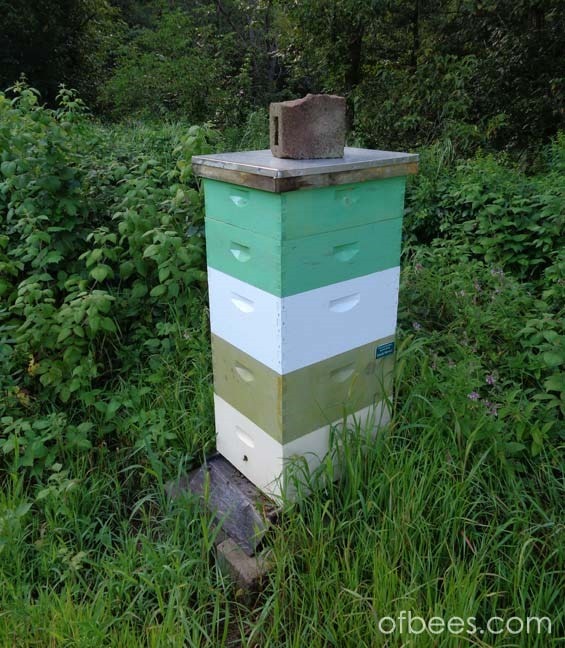 On a commercial scale this would be pretty much impossible, since the optimal time for raising queen bees (summer) and starting new colonies (spring) does not match up – it is going to take some special management to make it work, but it is possible! We are really lucky to have the University of Minnesota relatively local to us and to get accepted into their yearly queen-rearing classes. 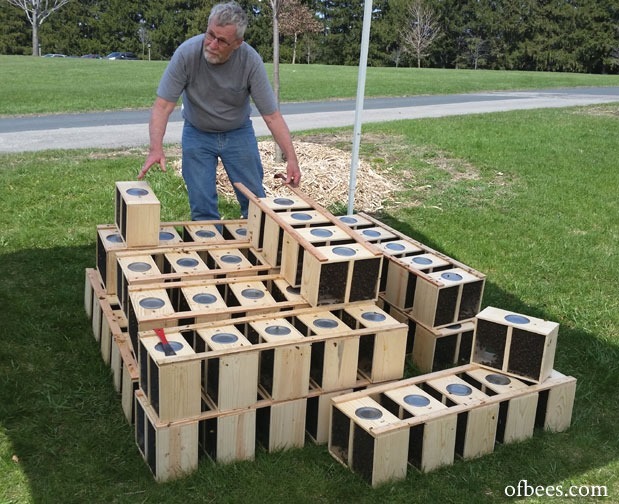 Thanks in large part to our awesome hive share sponsors, we installed seven new colonies of bees in our apiary this spring! 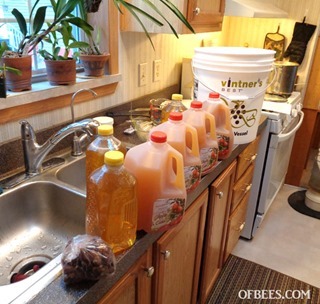 In the fall of 2013, we had our first honey harvest! 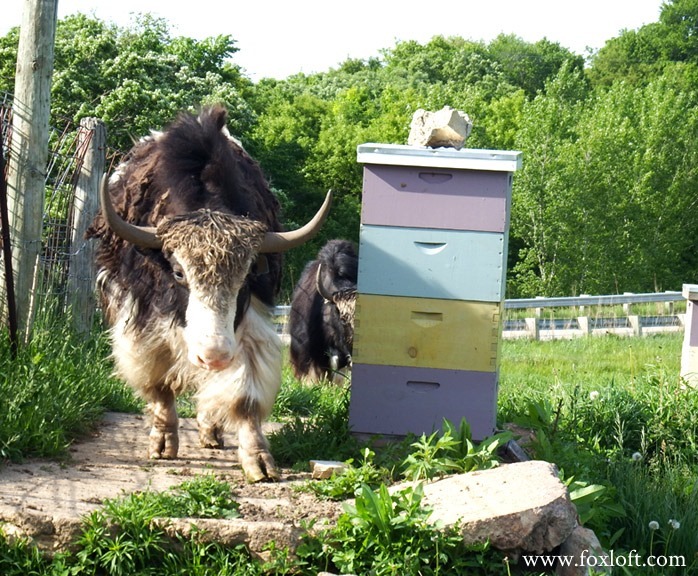 Here in Minnesota the bees need about 100lbs of excess honey for themselves to get a colony through the winter, and since we don’t feed them sugar syrup or take their own stores away, we don’t get a whole lot of excess. Our bees had a pretty productive year, however, and we were able to bring some home and experience the process of collecting and bottling the honey by hand. We had wonderful luck over winter 2012, with both of our hives surviving and strong as the winter weather thawed into spring. 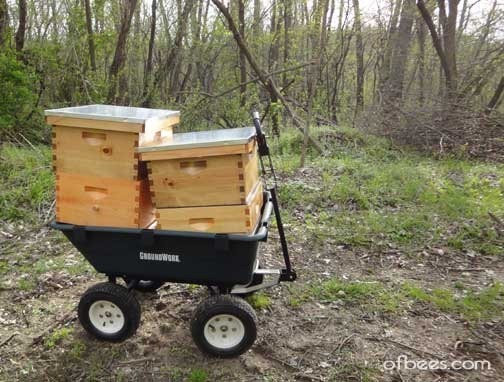 We decided to expand our apiary, adding two new hives in the spring and one later in the summer. How do you get new queens to establish new hives? By mail, of course! Here is a shipping container especially for bees, sent via the U.S. postal service (yes it is legal to mail properly labeled bees).